I enjoyed very much staying at mountain huts while trekking the Tour du Mont Blanc and when I did the Dolomites trek. And I also learned a few things regarding “etiquette”. 1. During high season, book in advance. Mountain huts can only accommodate a limited number of people. Advance booking is highly recommended, especially if you plan to stay in a hut offering also double rooms. There are only a few, if any, and they usually get reserved long before the trip. When you book, inform the hut owners of any dietary requirement or allergies, in order to have them prepare meals according to your needs. 2. Expect perfunctory service rather than super friendly and welcoming. It’s not that they’re not friendly but they are very busy, understaffed, and likely very tired. 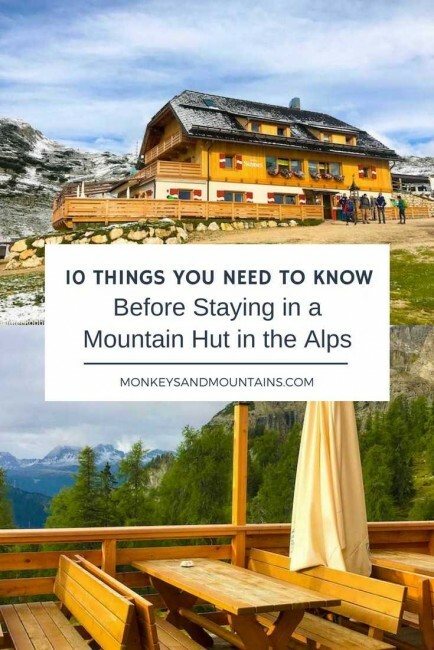 Hut owners and the staff are extremely busy in summer, all the most when margin a hut along well-known circuits like the Tour du Mont Blanc, or in the Dolomites. It’s not uncommon that they work 14 – 15 hours a day for days on end. Service is also different in Europe than it is in North America and much of it is cultural. Most Europeans don’t do the Hi, how are you? type of greeting. Once you know this you can better appreciate the cultural differences. 3. Plan to arrive before 6:00 pm, between 4:00 to 5:00 pm is better. Dinner in the huts is served at a pre-set time, usually somewhere between 7:00 – 8:00 pm. By arriving before, you’ll have time to check in, shower and rest a bit before dinner. 4. Take off your hiking boots before entering the hut if they’re muddy. At some huts, you’ll be required to take them before you enter even if they’re not muddy. You’ll see a shoe rack so follow by example. In any case, all the huts will require you to take off your hiking boots before entering the sleeping quarters. You can either bring your own slippers, wear socks or wear the hut shoes that most huts provide. You’ll leave your hiking boots and poles by the entry or in an equipment room. Don’t bring these into your room with you. I can’t emphasize how important following these guidelines are. Not doing so is likely to result in a tongue lashing from an upset hut owner who now has to do more cleaning. 5. When you check in, tell the hut owners your name or show them your booking form. Remind them of any dietary preferences (vegetarian, etc.) or allergies that you mentioned when you booked. Even if you have already informed the huts at the time of booking, you’ll need to tell them again when you arrive so that they know who you are. If you don’t do this, you likely only get whatever everyone else is having. As the huts are so busy they’re not generally open to special requests unless they’ve been previously notified. 6. Whether you’re staying in private double or dormitory accommodation, you’ll likely be sharing bathroom facilities so be respectful. All the huts have showers, some will require a small fee of a few euros. Some are timed to keep showers short. You’ll need to bring your own towel at most huts. Everyone needs to use the mirrors and other facilities so now’s not the time to spend hours primping in front of the mirrors. 7. Respect the quiet/lights out policy. For most huts, this is around 10:00 pm. Please respect this and be quiet. Other hikers are tired and want to sleep and won’t be happy if your chatting is keeping them up. If you’re staying in private double accommodation, please keep your voice down after 10:00 pm. Hut walls tend to be thin and voices easily travel to other rooms. You’ll likely meet a lot of European hikers and they can be blunt if you’re not following the rules. 8. Bring your own sleeping bag liner. This also applies if you’re staying in private double accommodation. Huts will provide blankets and pillows but you still need to bring a liner. Have a look t my Tour du Mont Blanc packing list, which indeed can apply to any long-distance hike in the Alps. 9. Don’t hog the charging devices. Plugins will be scarce, especially in dormitories so bring a charger that allows you to charge multiple devices at once. Once your gadget is charged unplug it so that someone else can use it. 10. Be at breakfast at the assigned time. Some huts will serve breakfast at a fixed time while others will have a set of fixed hours, i.e 7:30 and 9:00. Be sure to be there. If you come too early or too late, you likely won’t be eating breakfast. This sounds like such a great experience! @Juan, I highly recommend staying in a mountain hut at least once in your life. It's a unique experience and a great way to experience local culture.